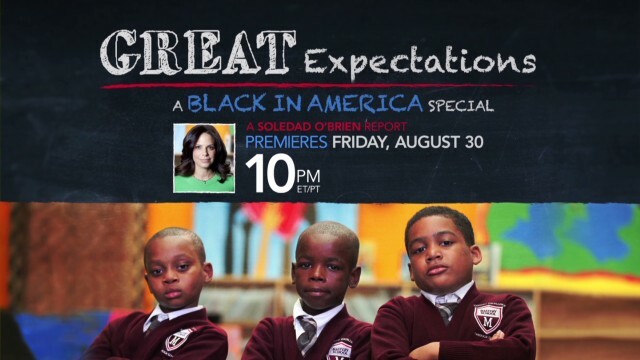 Journalist and Producer, Soledad O’Brien, reports from the front lines of the education achievement gap in the latest edition of the award winning franchise, “Black in America.” The documentary explores why so many black children are failing in reading and math at dramatic levels, compared to their white counterparts. In Great Expectations: A Black in America Special, O’Brien follows at risk students for a year along with their parents, and educators. The documentary explores the best ways to educate children of color who are living in poverty. The new, one-hour documentary will debut Friday, August 30, at 10:00pm and 1:00am. All times Eastern. When seven-year-old Lavon Longstreet meets O’Brien, he is nearly two years behind his grade level in reading and math – and his experiences are not uncommon in Minneapolis. In Minneapolis, only three in ten of all black children meet the Minnesota Department of Education’s standards for their grade level, while eight in 10 of all white children meet those standards. The disparity between the large numbers of children of color who do not pass minimum education standards, relative to the number of white children who do, is known as the education achievement gap. The Minneapolis Public Schools Board of Education (MPS) and local charter school CEO, Eric Mahmoud have partnered with a goal to try to close that gap – and Mahmoud has successfully narrowed this gap at his schools. Lavon’s mother has enrolled him in Mahmoud’s Mastery School, in an effort to help keep him from falling further behind academically, and hoping to curb his behavioral problems that were beginning to interfere with his education in the public school system. O’Brien follows Lavon’s progress at Mastery for a full year – and she reports on the battle brewing over how to address the achievement deficit in Minneapolis. That debate – which is echoed in school districts across the U.S. – centers on whether public funds should be used to help underwrite charter schools. Mahmoud already runs two elementary charter schools in Minneapolis. If Mastery is a success, he has an agreement with MPS to open three more within the next ten years. The student-to-teacher ratio in Mahmoud’s schools is about 1:14; most of Minneapolis’ public elementary schools have an average student-to-teacher ratio of 1:26. His highly structured methodology emphasizes repetition, drills, more classroom time, as well as academic and behavioral discipline. His schools administer tests every six weeks to monitor student progress. Critics of Mahmoud’s methodology, including public school teacher Robert Panning-Miller, assert that although Mahmoud’s schools teach his students to pass the state’s standardized tests, tests scores are not comprehensively representative of learning. Panning-Miller points out to O’Brien that charter schools siphon funds needed for public schools – and that, unlike Mahmoud’s schools, only a very few of the city’s charter schools are actually performing better than the city’s public schools. Also, because Mahmoud’s students are almost all black and from low income homes, some critics ask if his schools are re-segregating public education by race and class – which studies suggest comes with disadvantages. Professor Myron Orfield of the University of Minnesota Law School and the director of the Institute on Metropolitan Opportunity says studies show that learning in a segregated environment comes at a cost to the very children that these schools seek to help. “Integrated schools tend to have more resources…so they have more tax base in those jurisdictions. They tend to have higher qualified teachers…tend to be in districts that have more money. They also have powerful peer groups in those schools – that are geared toward college and graduation,” Orfield says in the documentary. O’Brien also speaks to Minneapolis Public Schools superintendent Bernadeia Johnson, who assures her that the MPS’ willingness to divert some public funds to charter schools is intended to meet an urgent need not being met by the public schools in her district – not an indication that she has given up on improving public education. “I believe that because we’ve set low expectations for some of our students, they’ve risen to the level that we’ve expected them to,” says Johnson. O’Brien asks Mahmoud where he expects the debate over how to close the achievement gap – and change those expectations – when looking ahead 10 years: “I think that we’re starting to see a lot of the innovations that we’ve incorporated in our program…they’re going to incorporate in theirs [public schools],” he says.